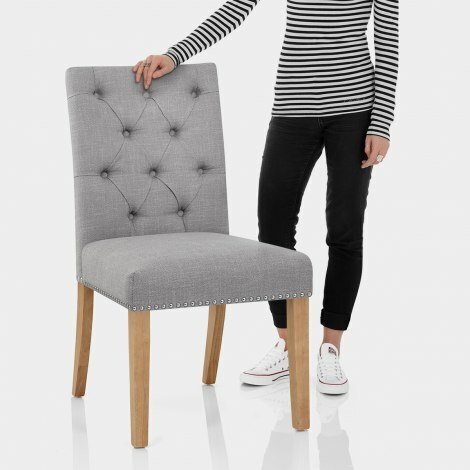 The perfect blend of elegant design and practical versatility, the Barrington Oak Dining Chair Grey Fabric offers a contemporary twist on classic chair design. Simple yet chic, the Barrington is guaranteed to turn heads. Covered with on-trend light grey fabric, its neutral aesthetic is the ideal partner to all interior styles. Meanwhile, a tall backrest, sprung and belted seat, and cushioned pad offer unrivalled support. 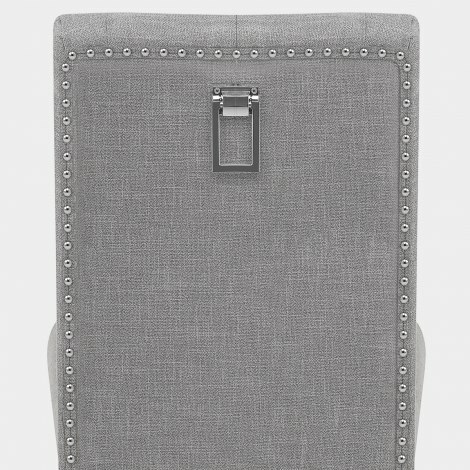 True to tradition, the backrest boasts a unique button and pleat quilted design, complemented by metal stud detailing around the seat edge, and a rectangular chrome handle on the back. Four tapered legs, crafted from solid wood with a light oak finish, support the chair, complete with protective floor plugs designed to minimise damage to most surfaces. "They are exceptional quality and very robust"
First time ever ordered without seeing furniture!! Totally love the chairs brilliant service literally next day bang on time. Good quality and look great! I had been looking for the ‘right’ dining chairs for some time when I found Atlantic. Brilliant choice and I found the Barrington Oak in grey. After reading the excellent reviews and as a bonus on sale I have just received my first chair within a few days. It is very easy to assemble and looks really classy. Great quality and really sturdy. I have just ordered the final 3 chairs and really looking forward to their arrival. Thank you for the stress free and high quality service Atlantic. I will definitely use the site again and have my eye on a few of their huge range of light fittings. We ordered 4 of these. They are exceptional quality and very robust. We were looking for a stylish chair to contrast with our homemade industrial/rustic dining table and came across the Barrington. Based on our experience we are very pleased with our purchase and would highly recommend both the chair and Atlantic Shopping to anyone looking for quality at a reasonable price. I had to wait a few weeks for it to come back in stock, but it was worth the wait! They are as beautiful as the pictures. And well priced compared to others I’ve seen on the internet! Fab quality, nice and comfy!